Natural Gold by Pretty Bird - DISCOUNTED! This innovative new product contains Nucleotides which can improve your bird's immune system. Ideal for Cockatiels, Quakers, Conures, and similar small-sized birds. Helps support a healthy immune system by including micronutrients that assist in cellular reproduction. The inclusion of these micronutrients helps improve the function of the digestive system by stimulating the villi in the digestive tract, which reduces digestive stresses. Additionally, the micronutrients assist the liver in functioning properly with as little stress as possible (recommended for birds already experiencing liver difficulties). The light, crunchy texture and wild berry flavor has great acceptability by birds. PLEASE NOTE THAT THIS FOOD WILL BE REPACKAGED FROM BULK IN A TOTALLY BIRD-FREE ENVIRONMENT. 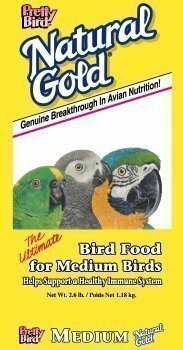 Ideal for Pionus, Eclectus, Greys, Macaws, Cockatoos, and similar medium to large-sized birds. Helps support a healthy immune system by including micronutrients that assist in cellular reproduction. The inclusion of these micronutrients helps improve the function of the digestive system by stimulating the villi in the digestive tract, which reduces digestive stresses. Additionally, the micronutrients assist the liver in functioning properly with as little stress as possible (recommended for birds already experiencing liver difficulties). The light, crunchy texture and wild berry flavor has great acceptability by birds.